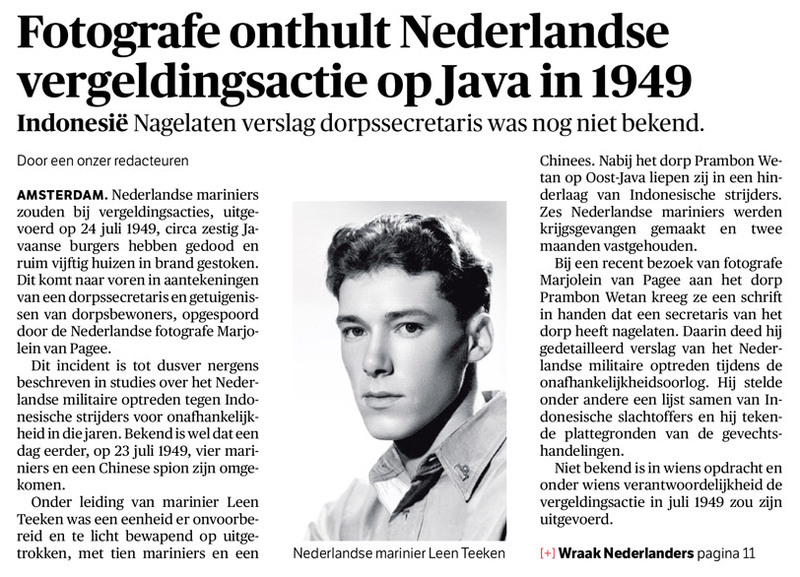 Dutch marines took revenge on 24th of July, 1949 at approximately sixty Javanese civilians while about fifty houses were put on fire. This is reflected in notes of a village secretary and testimonies from villagers, traced by the Dutch photographer Marjolein van Pagee. 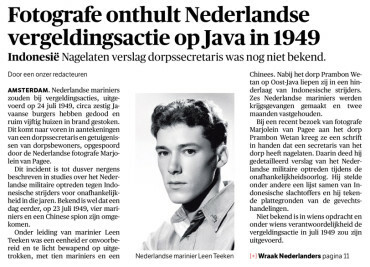 So far this incident has not been described in studies of the Dutch military action against Indonesian fighters for independence in those years. Known is that a day earlier, on July 23, 1949, four Marines and a Chinese spy died. A patrol, led by marine Leen Teeken, left quite unprepared and just lightly armed with ten Marines and a Chinese. Near the village Prambon Wetan in East Java they were ambushed by Indonesian soldiers. Six Dutch marines were taken as prisoners and captured for two months. During a recent visit by photographer Marjolein van Pagee to the village Prambon Wetan she got a script of a secretary of the village. It’s a detailed report of the Dutch military actions during the war of independence. 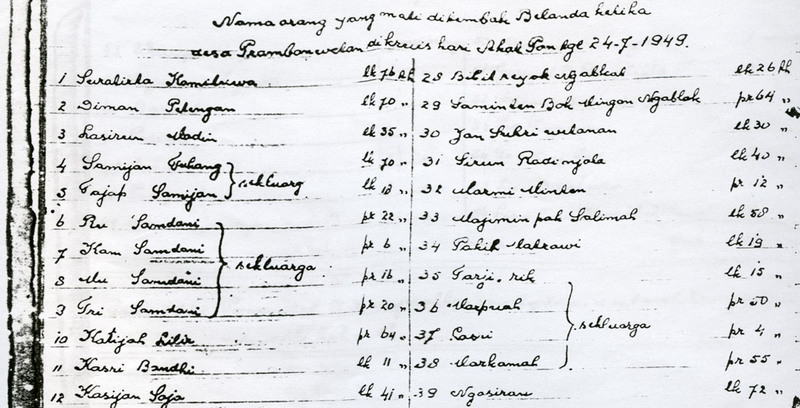 He compiled a list of Indonesian victims and added maps of where the fighting took place. Not known is by whose order and under whose command the retaliation took place in July 1949. DID THE DUTCH TAKE REVENGE? In July 1949 a Dutch patrol ran into an ambush near an Indonesian village. A day later, the village was burned down. What happened in Prambon Wetan? Twice three men. A bloody history links them together with more than seventy deaths. The three who are living in East Java, don’t know the other Dutch three. About their shared past is not everything yet discovered. Only the Dutch side of the story has entered our ‘patriotic’ historiography. For veterans of the Marine Corps it is even a known story: the patrol Teeken. On July 22, 1949 the Dutch marine Leen Teeken takes over command of the military post Rengel in East Java. The very next day he immediately initiated an inspection patrol in this troubled area, to establish his authority, looking for fighters of the guerrilla army ‘TNI’ who fight for an independent Indonesia. Previously Dutch s oldiers of the Land Army had bombed Prambon Wetan village with mortars which killed several civilians. In June, the village chief was slain when he tried to throw a grenade at a Dutch patrol. End of July 1949, former Marine Ben Reurling (88) was under command of Teeken. More than 65 years later, he calls it “a big mistake” that Teeken left unprepared and just lightly armed with only ten Marines and a Chinese collaborator. Reurling remembers the ominous silence of the deserted village. Almost immediately the Dutch patrol received a barrage of bullets fired from an ambush. In a fierce battle Teeken and three other Marines got killed. The Chinese spy who also got killed by the bullet was cut to pieces with knives. “I blame Teeken for this; it is his fault that those guys are dead,” says former Marine Reurling. He himself was hit by bullets in the chest and arm. Along with six fellow fighters, he was taken as a prisoner. One of them died in captivity from malaria. Two months later, the Marines were freed again. Reurlings family in the Netherlands was told that he was killed. His obituary was already published in the newspaper when they found out that he was still alive. 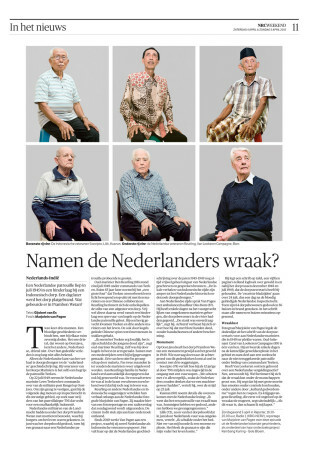 Reurling and other Dutch and Indonesian eyewitnesses told their story recently to Dutch photographer Marjolein van Pagee. She portrayed them and a radio report will be broadcast Sunday night. The quotes in this document relating to her research. On the Dutch side Van Pagee spoke with ambulance-driver Dies Bom (87). A few days after the firefight he had to take the corpses of the dead marines who were thrown into the river by the villagers. “The stench was unbearable,” he says. Afterwards he is surprised that he took them with his bare hands, without gloves or other protection. East Java, the village Prambon Wetan dedicated a monument to the violence of 1949. Who asks about the background of this memorial comes quickly in contact with three eyewitnesses. Soecipto (78) tells how, as a 12-year-old he was trained by TNI-combatants how to use a firearm. “We shot all together at once, so that the Dutch would think we had a machine gun,” he says, about the fight on 23 July. He puts a script on the table, a fifteen-page logbook about the violence in and around the village between December 1948 and July 1949, written by the village secretary. The ‘darkest’ page is about July 24, one day after the bloody confrontation with the Dutch patrol when 64 villagers got slain and 56 houses were burned. The script minutely listed all names and houses. 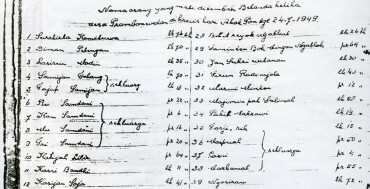 Photographer Marjolein van Pagee showed the death list from the script of the village secretary to Dutch marines who were on the spot in 1949. Former lieutenant Carel van Lookeren Campgne (89) is one of them. He arrived a few days after the explosion of violence in the area and took part in a search for the not returned patrol led by commander Teeken.